Hey, guys, I recommended a holiday book to you in the last post and I've got a couple more for you today. Both of them are picture books but don't just roll your eyes when I say that. Some guys would think that picture books are only for little kids. Wrong! These are good for guys at any age, even for a MANLY MAN like the Iron Guy. Both of them are about Hanukkah, the Jewish festival of lights, that is going on this very week. If you've never read the history of Hanukkah, be sure to check it out. It's a really great story--an evil emperor (Antiochus), a small band of rebels (the Maccabbees) and a miraculous intervention. (hmmm--does this sound like the story of a certain set of movies? And the new one comes out this very month? Coincidence??? You tell me!) Both of these books can be read quickly but the memory of these books will last a really long time, maybe even long after the holidays. Maybe even the rest of your lives. great story! It takes place during the Revolutionary War. During the brutal winter of 1777, General George Washington and his troops were camped in Valley Forge. Things did not look good for them. Some of the men didn't have shoes or coats. No one had enough food. And the British showed no sign of leaving. As Washington made his rounds, he saw one soldier lighting a candle in one of the cabins. The general was curious, so he asked what the soldier was doing. The young man said he did it for Hanukkah and, since Washington had never heard of it, told him the story of the ancient fight and the great miracle. Could that tale from long ago restore the general's faith in the Patriot's cause? As I said, this is a great story. And the illustrations are truly outstanding. The very first one sets the tone for the desperate state of the Patriots. There's a lone soldier, patrolling the camp in the snow. He has no gloves. He's trying to keep warm in his thin coat. BRRR! I could feel the bitter cold! 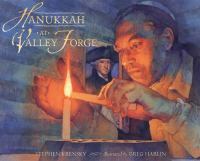 But as the soldier relates the Hanukkah story, the illustrations shift back and forth form Valley Forge to ancient Israel, thereby showing the parallels between the Maccabeean revolt and the Revolution. It works really well and heightens the terrific emotional impact of this story. As I said, you'll read through this book quickly but you won't forget it anytime soon! 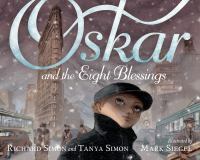 And the second is a truly terrific book, Oskar and the Eight Blessings by Richard and Tanya Simon, illustrated by Mark Siegel. This is another book in which the words and pictures combine to make an unforgettable experience. It's 1938. Oskar and his family live happily in Europe until The Night of Broken Glass, the beginning of the Holocaust. His parents put him on a ship to America so he can stay with his Aunt Esther. His father tells him, "Oskar, even in bad times, people can be good. You have to look for the blessings." He arrives in New York on the seventh night of Hanukkah, which also turns out to be Christmas Eve, with only a photo and address for his aunt. And no money. Even if he looks for the blessings, could that be enough for one lone boy walking 100 blocks in a strange city? Wow! I really felt for Oskar all alone in the big city. But I also felt good, really good, when the blessings came. And I don't mean feeling good in some cheap, cheesy way, like the feeling you get in many of the sugary and sentimental books you see this time of year, It's a good and uplifted sensation. The way you feel when something good comes out of a bad situation. And the artwork!! It really moves the story along and helps you to see things from Oskar's perspective. What a terrific book! This one should not be missed. In fact, you'll probably want to read and reread this one every year. You'll notice that both these books take place in two of the darkest periods in history, times when things seemed hopeless. Yet these people persevered when they, like the soldier at Valley Forge, remembered the old story or, like Oskar, remembered his father's words. Their trust, their faith, if you will, got them through like a candle in the dark. I've heard a lot of grownups talk about how these festivals of lights, like Hanukkah and Kwanzaa with their candles or Christmas with its lights or even Diwali, take place around the winter solstice, the darkest time of the year. It's as if something in the human spirit cries out that light will overcome darkness eventually and we need to remind ourselves of that when things are darkest and coldest. That's not easy to do--in fact, keeping that faith during hard times is the toughest thing you'll ever do as a guy. (or a girl) That's why reading is so important! Reading books like these gives us the mental and emotional fuel to keep going. Not only is reading fun and exciting, it builds you up and strengthens you on the inside, where it really counts. That's one reason I keep telling you about terrific books. Reading strengthens and enriches your lives. Don't forget that! Well, I hope you don't mind my going deep on you. Really great books can do that to me. Before I go, I also want to thank my online friend Heidi Estrin for giving me the idea to review these books. I had been meaning to read them for some time but when she told me about #Readukkah, an event hosted by the Association of Jewish Libraries that encourages people to review Jewish books this week. And I'm glad she did because I really enjoyed them. Thanks, Heidi! And be sure to check these books out and tell all your friends and families about them. Thanks for the recommendations! I'd love to add a few Hannukah books to my holiday picture book collection. The illustrations for the Oscar book look lovely. "Not only is reading fun and exciting, it builds you up and strengthens you on the inside, where it really counts. That's one reason I keep telling you about terrific books. Reading strengthens and enriches your lives. Don't forget that." You speak the truth. Both of those books look like great additions to a book shelf -- I'm especially interested in Oskar and will have to track down a copy. Thanks for sharing! These look like great books for Hanukkah! Thanks for sharing at the Kid Lit Blog Hop! Thanks for hosting the Blog Hop! These are really great books and will stay with you. A New Year's Treat--A Review from Graham!